Gionee has launched its brand new smartphone Gionee Marathon M5 Lite in India. Gionee company last month launched its own smartphone Marathon M5. The company has just launched its new smartphone Marathon M5 Lite. The most special feature of this smartphone battery. It was the 4000mah battery. Once the flower is charging its battery can last up to 3 days. The smartphone you can charge the smartphone is too. The Android version 5.1 has been used in lollipops. Marathon M5 Lite 1.3 GHz 64-bit quad-core MediaTek MT-6735 chipset, 3GB RAM, 5-inch HD display, 32GB inbuilt storage, 8MP rear camera, 5MP front camera is. The smartphone weighs 182 grams. The Wi-Fi connectivity, Bluetooth 4.0, microUSB has been. 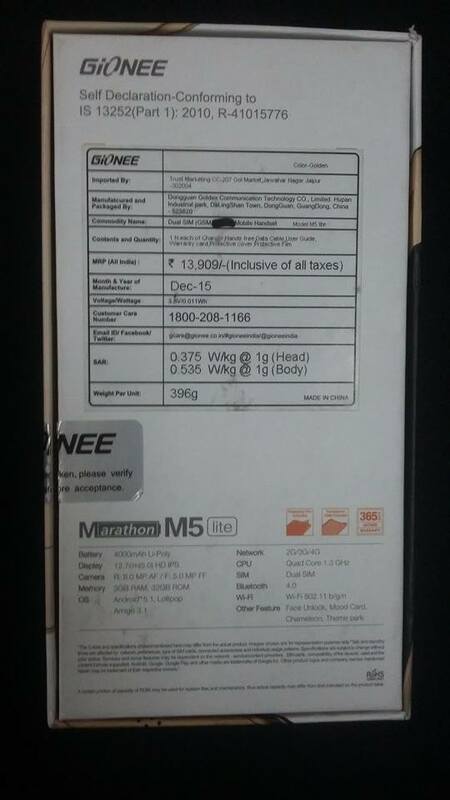 Gionee Marathon M5 Lite available today in India and Price at Rs.13,909/-.